This chapter presents a critical examination of current issues and controversies in English language teaching (ELT) in South Korea (henceforth Korea). It uses the Korean context to illustrate how neoliberal celebration of English has led to exacerbating inequalities among social classes, as represented in the term “English Divide.” Referring to a widening social polarization based on English competence, English Divide serves as the analytical focus of how communicative English functions as symbolic capital in Korean class distinction. The discussion highlights shifting ideologies of language and education in Korea regarding neoliberal construction of language as commodified “skills” (Heller 2010; Urciuoli 2008) and restructuring of English language learning as an entrepreneurial self-development project to boost the individual’s competitiveness in the global labor market (Shin 2016; Urciuoli 2010). In this context, “authentic English” or communicative English obtained in Western English-speaking countries emerged as new legitimate English in Korea (Shin 2012). The chapter begins with a brief discussion of neoliberalism and ELT as the backdrop to examine the Korean context. This is followed by an overview of politics of ELT in Korea in relation to neoliberal education reforms implemented during rapid globalization of the society. Highlighting differential access to legitimate English, or communicative English, by “Early Study Abroad” (ESA, or pre-college-aged study abroad) students and “English Abandoners” (yeongpoja, acronym for yeongeo [English] pogija [abandoner], literally meaning those who have given up on learning English, or “English Underachievers”), the following section examines why and how “English Divide” emerged as a buzz word in neoliberal Korea. The next section offers critical evaluation of language education policies of the Korean government that intended to enhance communicative English teaching in public schools and address the English Divide that remains due to the failed attempts to accomplish that goal. The chapter concludes with a discussion of implications for critical ELT policy and practices for more inclusive education in Korea and around the world. It is evident that linguistic skills can be economic resources, and even if some skills are merely status markers, their acquisition may be the focus of economic activity (Irvine 1989, p. 256). Neoliberalism, as the form of dominant capitalism in recent decades and as a theory of political economic practices, highlights individual entrepreneurial freedom, free market economy, and privatization and profit maximization (Bourdieu 1998; Harvey 2005). Extension of market-based principles to multiple domains in life under neoliberalism has further transformed notions of self, language, and education. For example, an ideal neoliberal subject is an autonomous, flexible, and self-regulating human being, or human capital made up of bundles of skills, who is well-prepared for global competition. Language constitutes a key set of “soft skills” of this neoliberal subject to enhance the value of his/her human capital. Education is a key site for human-capital development and is thus transformed into an economic resource both for the nation-state and the corporate sector as a tool to keep up with the globalized new economy (Hyslop-Margison and Sears 2006). Therefore, language learning becomes skill production, or project of entrepreneurial self-development to increase the individual’s employability in the job market (Block et al. 2012; Cameron 2000; Shin and Park 2016; Urciuoli 2008, 2010). One problem with this pragmatic view of language where language is valued as commodifiable resource (Heller 2010) or in terms of its usefulness in achieving economic development or social mobility (Wee 2008 calls linguistic instrumentalism), is that it turns language learning into an individual responsibility detached from the social context. That is, English language learners, as ideal neoliberal subjects, are expected to be able to acquire necessary linguistic skills as long as they work hard through endless self-improvement projects regardless of structural inequality related to their language learning (Park 2010; Shin and Park 2016). In this sense, ideologies about language and neoliberal competition which equate language as a set of flexible skills and English language learning with individual effort of self-development, disconnected from external social structures, resonates with the ideology of meritocracy. That is, they both rationalize an individual’s hard work as a source of academic success in schooling and/or in language learning in order to mask the unequal structure and power that mediate one’s access to “good” English, and subsequently construct the image of English as equally accessible to all (Kubota 2011; Park 2010; Shin 2016). ELT scholars across the globe have begun to explore neoliberalism in relation to language policy (Piller and Cho 2013), ELT teacher education (Block and Gray 2016), language testing (Kubota 2011), and classroom interaction (Chun 2009), among others. In the East Asian context, English language ability is a much sought-after resource for survival in the increasingly bleak job market, not only in Korea, but also in China (e.g., Gao 2014), Hong Kong (e.g., Lin and Man 2010), Japan (e.g., Kubota 2011), and Taiwan (e.g., Price 2014). The Korean case is particularly interesting, however, to examine how and why ELT is closely bound up in the social selection process within a political economy framework focusing on neoliberalism. Indeed, much of the emerging research in ELT examined South Korea as a key locus of exploring the intersection of English and neoliberalism, notably through the case of jogi yuhak (Early Study Abroad) students in multiple destinations across the globe (e.g., Lo et al. 2015; Park and Lo 2012; Shin 2012, 2014; Shin and Park 2016). The next section further expounds upon the impact of neoliberalism on ELT in Korea. Since English was initially brought into Korea with Christianity in the late Choson dynasty (1392–1910) (Sung 2002), English has long held key symbolic capital in Korea (Shin 2007). Key to understanding the modern context is the military tension between communist North and capitalist South (and between the USA and North Korea), which was often discursively and politically constructed as a means of rationalizing oppressive regimes since the Korean War (1950–1953). Also, due to the hegemonic role of the USA in political, economical, and cultural domains in Korea, English (American English in particular) has long maintained its status as the most popular and important foreign language, at least in the South (Kim 2011; Kim-Rivera 2002; Shin 2007). During the rapid neoliberal globalization of the society since the 1990s, English has become even more important as symbolic capital in Korean class distinction. The 1995 presidential “Globalization Declaration” (segyehwa seoneon) during the Kim Yeong-sam government (1993–1998) highlighted enhancing the nation’s global competitiveness. To this end, educating Koreans to develop as competitive global citizens has become important and the government has highly emphasized English education. Korea’s entry to the globalized market economy, as evidenced by its joining the Organization for Economic Cooperation and Development (OECD), accelerated the economic neoliberalization of the society. In 1997, the “Asian financial crisis” (or the “IMF [International Monetary Fund] crisis”) severely affected Korea and rapid IMF-prescribed economic restructuring to pay back the IMF bailout packages was implemented by the two succeeding regimes of Kim Dae-jung (1998–2003) and Roh Moo-hyeon (2003–2008). This had resulted in fast-paced economic neoliberalization under the supposedly most democratic governments in modern Korean history (Shin 2016; Song 2009). Numerous media portrayals of Korean government officials unable to speak “good” English with foreign negotiation partners in the aftermath of the Asian financial crisis further strengthened Koreans’ belief in the importance of “authentic” English for Korea to survive severe competition in international markets. The injae required by Samsung Electronics are those who combine creativity, (field-specific) professionalism and global competence….global competence is global communication skills, openness, and global experience. The global communication ability to express their thoughts and communicate with others from anywhere in the world is an important competitiveness in the IT field that needs to compete all over the world. Openness and global experience can be understood in a similar way. (‘Global Injae’ by Corporate HR Personnel Kim Jong Heon, Samsung Electronics Human Resources Development Center, JoongAng Ilbo, September 19, 2012, Hyunjung‘s translation, emphasis added, http://news.joins.com/article/9365275). As illustrated above, the increased labor market demand (or the ideological rationalization of such demand) for oral communication skills in the neoliberal economy (Cameron 2000; Heller 2010) has constructed English, or global communication skills, as an essential part of a skill set of global injae as an ideal neoliberal subject (see also Shin 2018). In addition to the context added from the excerpt above, what counts as “good” English (or legitimate English) in Korea is English ability combined with openness (to diverse culture and people) and global experience, that is, English learned in (Western) English-speaking countries. Research on educational migration of Korean students and families continue to report that preferred destinations for their study abroad are clearly stratified based on expenses; in this hierarchical structure, other modes of English language competence such as “fluent, but non-Western ways of speaking English,” are not recognized as legitimate English (e.g., Shin 2013). For example, English-speaking countries within Asia such as Singapore and the Philippines are often constructed as illegitimate locations for their English learning or merely as a springboard to study at universities in Western English speaking countries, and students have anxiety over the value of the “kind” of English learned in those countries (e.g., Jang 2018; Park and Bae 2009). Consequently, communicative English learned in Western English-speaking countries has become a new form of legitimate English and a key source of symbolic capital in building elite credentials in neoliberal Korea. To produce such global injae to boost the nation’s competitiveness in the global market, a radical shift in educational values and goals from egalitarianism to elite education has occurred (Shin 2016). For example, in 1995, an extensive neoliberal education reform package, “the education reform plan for establishment of new education system” (shin gyoyuk cheje surip eul uihan gyoyuk gaehyeok bangan), or “the May 31 Reform” (which was announced on May 31, 1995), was proposed by the Presidential Commission on Education Reform under the Kim Yeong-sam regime. The May 31 Reform was one of the most fundamental reform policies in the history of education in Korea and highlighted such rhetoric as “individual consumer needs (choice),” “diversity,” and “autonomy and accountability” (Kim 2004). As such, the reform plan emphasized increasing autonomy of universities and diversifying their admission process as well as increasing diversity in school types and (student) choice. Various types of high schools for elite education opened in the 2000s with the stated aim of cultivating students who would be competent citizens in a globalized world. Many of these elite high schools offer English-medium education. Average tuition is about eight times as high as that of regular public high schools (Eum and Kim 2014). In the higher education sector, neoliberal emphasis on competitiveness brought about the spread of English as a medium of instruction through various internationalization movements by universities (Piller and Cho 2013). As such, an applicant’s communicative English competence has become increasingly central to access elite secondary schools and universities linked with the image of the global injae. Therefore, recent ELT policies created within such discourse of neoliberal globalization emphasized communicative English teaching. While grammar-translation was traditionally the dominant method in English teaching in Korea, since mid-1990s, the government has come to emphasize the functional English proficiency of students as global citizens. Therefore, the national curriculum introduced a dramatic shift in focus from accuracy to fluency and communicative competence, which was believed to boost the nation’s competitive edge in the global market. Subsequently, the English section of the College Scholastic Ability Test (CSAT), the national college entrance examination introduced in 1993, emphasized reading and listening comprehension skills, instead of phonological, lexical, and grammatical knowledge emphasized in the previous college entrance exam. Since communicative ability is believed to better develop when one starts to learn English at an earlier age, English was also introduced as a regular subject in elementary schools in 1997 (Jung and Norton 2002). Moreover, expensive private English kindergartens sprang up for children’s early exposure to English. To sum up, this section elucidated the impact of neoliberalism on ELT in Korea focusing on the emergence of “global injae” as an ideal neoliberal subject as well as new forms of legitimate English as indispensable resource for survival in the global market. The following section explores how the subsequent “English frenzy,” or heated pursuit of English at all levels of society (Park 2009), has led to debates around the increasing inequality in English learning according to social class (Block 2014; Shin 2014), or otherwise known as the English Divide. The English divide deepens when it comes to recruitment of fresh graduates. Average English proficiency is not enough in a generation where many have been educated abroad or gone through intensive courses from an early age, a human resources manager at Shinsegae Group said. A 27-year-old jobseeker added, “It seems that Korea is going the same way as India, where totally different jobs are available for those who can speak English and those who can’t.” (English Deciding Factor in Success of Office Workers, Chosun Ilbo, May 01, 2010, http://english.chosun.com/site/data/html_dir/2010/05/01/2010050100315.html). Employees who outscore their colleagues by 100 points on the Test of English for International Communication (TOEIC) earn an average 1.7 million won ($1400) more a year, according to the report by Korea Development Institute, a state-run think tank. It also showed a one million won increase in parents’ income leads to raising their child’s TOEIC score by an average 21 points….The gap in spending on private English education widens to as much as ten-fold between households with monthly earnings above seven million won and those below one million won…. Scoring discrepancy between students from different income families in the college scholastic ability test is wider in English than in other subjects like math and Korean, according to the KDI study. (Editorial, Korea Herald, June 7, 2012, http://www.koreaherald.com/view.php?ud=20120607000793). This section illustrates how and why social reproduction through English education, or the English Divide, became a buzz word in neoliberal Korea. The discussion highlights differential access to “legitimate” English along social class lines focusing on two social groups: (1) “Early Study Abroad” (ESA, jogi yuhak) students, including returnees from ESA and (2) “English Abandoners” or “English Underachievers” (yeongeo hakseup bujina, which refers to low-achieving students in nationwide standardized exams). As illustrated in the previous section, a “good” command of communicative English is constructed as essential skills for Koreans to access quality employment in the neoliberal labor market and/or to be considered as successful global citizens in Korea. Yet, the kind of English valued in the job market, namely, communicative English learned as part of the speaker’s global experience, is often construed as unobtainable through regular public education alone, even if that is not always the case. Moreover, with the revival of elite education and diversified school choice, students with overseas English learning experiences or costly private education have better access to elite schools/universities which value English communication skills. Besides, as Park (2010) notes, the prevalence of narratives on successful upward mobility through the “self-management” project of English learning has further exacerbated middle class parents’ and students’ anxiety at a time when social mobility seems to be unlikely. Therefore, the sagyoyuk (private after-school English education) market, including ESA, has thrived even more due to middle class families’ investment in English private education to mitigate the risk of downward social mobility. It is remarkable that although the middle class shrank by 20–30% during the Asian Financial crisis, family expenditures on private English education still increased (Park and Abelmann 2004). According to Kim et al. (2012), households with highest expenditure on English private tutoring have the following common characteristics: location in the affluent Gangnam area in Seoul, having test scores in the top 10% of students in their school, parents with postgraduate education, and an average monthly income of more than seven million won. Subsequently, unequal access to “good” English (or English communication skills) by different social groups has become a topic of heated public debate in Korea (see also similar discussions in Japan [Kanno 2008] and Taiwan [Price 2014]). In the mid-2000s, the term “English Divide” appeared in numerous media reports and policy descriptions to refer to increasing social polarization based on English: that is, students’ English ability is presumably determined by the wealth of their parents and the difference in their English skills in turn contributes to their class reproduction. Media debates around “English Divide” thus demanded that public English education transformed to provide access to communicative English for all students and, in response, the government had to frame ELT policies supposedly to alleviate the English Divide (see the next section). In this sense, the emergence of the term “English Divide” and subsequent debates around it indicate increasing public awareness of the role of English in class reproduction in postfinancial crisis Korea. In this context, Early Study Abroad (ESA), or access to “good” English through transnational mobility, has become an important strategy for the Korean middle class to enhance their children’s global competitiveness (Park and Lo 2012; Shin 2012, 2013, 2014, 2016). ESA typically involves sending pre-college-aged students to Western English-speaking countries or international schools in Asian countries, to acquire “good” English competence so they can access better educational or employment opportunities in the future. ESA often goes beyond simple acquisition of linguistic competence and constitutes part of an entrepreneurial project to nurture them as competent cosmopolitans with transnational identities (Shin and Park 2016). Given that access to ESA is primarily determined by one’s family’s financial stability, ESA is a phenomenon constrained by class relations. For example, Shin (2016) exemplifies how various services and packaged products available at study abroad agencies further accelerate individual access to different ESA destinations based on their purchasing power. Namely, students from wealthy families tend to choose Britain and the USA for ESA, while less affluent students may go to the Philippines. Such hierarchy within the ESA market contributes to reproducing the dominant order of the global linguistic market, which privileges “standard” British or American English over English learned in the Philippines or within Korea. Likewise, “native-like” English from the West is construed as more valuable than English spoken by non-native Koreans in the Korean market (Park 2009), thereby creating a hierarchy between Koreans who have been on ESA and those who have not, and among the ESA returnees from Western English speaking countries versus the Asian periphery nations. For this reason, what matters in the Korean market is not mere proficiency in English, but English, often coupled with other cultural capital such as educational qualifications from Western countries, that serves as a symbolic capital, or capital of distinction (Bourdieu 1984). Whereas ESA students represent the image of aspiring global elites who seek English as a global commodity for university entrance and quality jobs, at the other end of the English Divide are English Abandoners or English Underachievers. While the term English Underachievers is more commonly used in the K-12 education context, English Abandoners may refer to a larger social group including university students and some young adults who have fallen behind, voluntarily or involuntarily, within the social hierarchy according to one’s English language competence. The term English Abandoners (yeongpoja) began to widely circulate in media reports during Lee Myung-bak’s regime (2008–2012) when the neoliberalization of education escalated. A related neologism is Sampo Generation (samposedae, a generation that has given up three things), referring to a rising young generation who has given up having romantic relationships, marriage, and children due to financial difficulties resulting from their economic conditions. The term first appeared in the publication, Talking about the Welfare State (Bokji gukga reul malhada), the special reports of Kyunghyang Shinmun, a representative liberal newspaper in Korea. The financial burden of starting a family is particularly heavy in Korea because family members are mainly responsible for the duties for each others’ welfare due to the lack of government welfare support. For the Sampo Generation, the burden has reached its limit given increasing living expenses, high tuition (and student loan) payments, and the precarious job market (Yoo and Park 2011). The term has since widely spread in media reports and everyday conversation, producing related new terms such as Opo Generation (Opo sedae, a generation who has given up five things including employment and housing) and Npo Generation (Npo sedae, a generation who has given up unspecified number of things in life). These terms are often adopted by young Koreans to refer to themselves as well. Similarly, the term English Abandoners (yeongpoja) began to circulate in online communities and media reports referring to students who have (strategically) given up on studying English to secure time preparing for other subjects in college entrance examinations or on job applications which often involved exams for open recruitment, or who have difficulty with academic studies in general and have thus abandoned English. English, particularly English communicative competence, supposedly takes long time for one to catch up with his/her peers without expensive sagyoyuk (private after-school English tutoring) once falling behind. In this sense, the category of yeongpoja has class implications because it will be relatively difficult for an (upper) middle-class student to become yeongpoja. As represented in phrases such as “yeongpoja TOEFL class (TOEFL class for yeongpoja)” or “how to escape from yeongpoja (yeongpoja tal chul beop),” however, yeongpoja is both an identity category (to refer to a group of people either as a self- or other-reference term) and a term to describe a social phenomenon (to capture the fact that more people are giving up on English believing that they will never be able to cross the English Divide). In the K-12 education context, the term English Underachievers (yeongeo hakseup bujina) appeared after the nation-wide standardized exam (iljegosa) was reinstated in 2008. According to Yang (2018), the stated purpose of the National Assessment of Educational Achievement (NAEA, iljegosa) was to build a comprehensive student service mechanism and to provide additional supports for schools with a large number of English Underachievers. By releasing the results of the test to the public, however, the government actually used NAEA as a way to stratify school districts, schools, teachers, and students (Byean 2017). While not all English Underachievers may be English Abandoners, this chapter uses both terms interchangeably given its focus on school English education policy. The emergence of English Abandoners is significant for recognizing how the broken promise of social mobility in post-IMF crisis Korea has led to differing educational aspirations among students from different social class backgrounds. Koreans’ excessive investment in English (or English frenzy) is sustained by their belief in the promise of English (Park 2011), that is, English communicative skills will guarantee access to good universities and middle-class jobs. Neoliberal discourse of endless self-development and emphasis on competition may be attractive to middle-class families such as those of ESA students because adopting such an entrepreneurial stance toward their English language learning may work for their class-based interest (De Costa et al. 2016). However, it does not attend to the interests of English Underachievers or those from working class families who do not anticipate any rewards brought by English in their future trajectories. Furthermore, while the unequal economic and social structure deprived the young generation of the opportunity to pursue important goals in life, by using the word “pogi (giving up),” discourses around terms such as Sampo Sedae and English Abandoners (yeongpoja) construct the issue as a matter of individual choice instead of structural inequality. At the same time, discourses around English Abandoners (yeongpoja) and English Divide indicate that there is a heightened awareness of unequal access to the acquisition of “good” English among Koreans as the perceived value of English communicative skills as desirable human capital in the neoliberal market has significantly increased through the active promotion of English by the government. In this sense, English Divide and the Korean government’s pursuit of English is reflective of the neoliberal transformation of Korean society as a whole. Given that the shadow of polarization between the haves and the have-nots looms over English education, the government should come up with fundamental measures to narrow the English divide. Specifically, the government should expand free after-school English classes and English camps during vacations for students from low-income families and remote rural regions. (Editorial, English Divide, The Korea Times, June 6, 2012, http://www.koreatimes.co.kr/www/news/nation/2012/08/202_112506.html). Due to a highly standardized and competitive public education system in Korea (Kim 2004), it is now essential for many Korean students to seek additional assistance in the sagyoyuk (private after-school education) market to catch up with their schoolwork or to improve their academic achievement to enter elite schools/universities. As such, differential access to quality sagyoyuk according to one’s social class further contributes to the reproduction of their social position. Given the central role of sagyoyuk in English education in Korea (Shin 2014) and subsequent anxiety over a lack of access to “good” English in public schools for Korean students and their parents, there is an increasing pressure for the government to provide a more equitable access to “good” English through public education (i.e., without sagyoyuk). 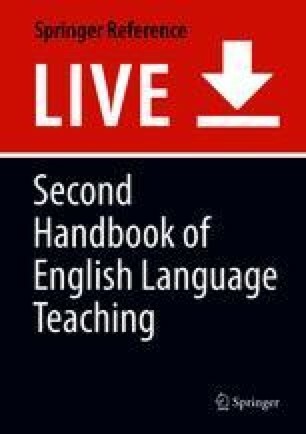 This section provides a critical examination of ELT policy initiatives intended to enhance English education in public schools and thereby level the English Divide. Focusing on policy around English-medium of instruction and tracking, the analysis highlights how the Korean government’s claimed efforts to provide access to communicative English for all students have only further exacerbated the English Divide in schools. As examined earlier, in recent neoliberal education reform in Korea, communicative English competence is constructed as a key skill for global human capital development. Therefore, ELT policy placed an enhanced focus on fostering communicative language teaching (CLT). For example, adopting English as the medium of instruction and improving teachers’ communicative English competence received a significant attention in policy and public debates. In January 2008, the new regime of Lee Myung-bak announced “Plans for Enhancing English Education in Public Schools.” The claimed purpose of this educational reform package was to improve communicative English teaching in public schools in order to reduce sagyoyuk (private after-school English education) expenses and to alleviate the English Divide. The proposal included planned introduction of an “English Immersion Program” or English-medium courses in upper elementary grades and secondary schools in order to improve communicative English teaching in public schools. Heated public debates and criticism around the proposal immediately arose. Contrary to the government’s claim, many Koreans believed that the planned implementation of the policy would radically increase private English education expenses and thus further intensify the English Divide. Although Lee Myung-bak’s transition team officially reversed their plan to expand English immersion to all subjects in schools in response to public criticism, English medium instruction has expanded through other policies such as Teaching English in English (TEE) and recruiting native-speaking English teachers (Jeon 2012; Shin 2007). In addition, English immersion education continues to expand in some elite private schools. Besides, government-funded English camp programs and “English villages,” or a simulated English-speaking community in an immersion environment, were created to provide alternative access to communicative English learning space for all students, particularly working-class children who cannot afford ESA (Jeon 2012; Park 2009; Shin 2006). The TEE policy requires that English be taught without L1 support in Korean EFL (English as a Foreign Language) classrooms in order to facilitate students’ communicative competence and to enhance communicative English teaching (for details, see Shin 2007). To this end, improving English teachers’ oral English proficiency or communicative ability became important in teacher education. In 1996, curricular innovation in preservice English teacher education programs emphasized teachers’ linguistic and pedagogical competence, instead of knowledge of theoretical linguistics and literature in the old curricula (Kwon 2000). EPIK (English Program in Korea) was launched in 1995 to recruit “native speakers” of English to strengthen teaching communicative abilities in Korean schools. TEE policy was first announced in 2001 but was further strengthened in 2008. For example, it was proposed that teachers who possess high English language proficiency and demonstrated CLT practices be granted a TEE certificate along with extra credits for promotion and financial support (Choi and Andon 2013; Lee 2014). Yet, macrolevel discourse represented in national ELT policy which construct English communicative competence as a key element of global competitiveness for Koreans is often in conflict with local practices in schools. For example, Shin’s (2007) interview with Korean English teachers reports that there was conflict between the government’s goal for English education, as represented in TEE policy (influenced by the discourse of globalization), and English teachers’ goals for English education (constructed through daily interactions with the students in the local classrooms). That is, the goal for English education implied in TEE policy (i.e., improving students’ oral conversational abilities to foster national competitiveness in a global market) was not congruent with the English teachers’ immediate goals for English education (i.e., understanding and supporting students and facilitating a broader scope of learning experiences for them). Furthermore, a lack of proper preparation to implement the policy into actual classroom settings caused confusion and conflicts in the classrooms. Similarly, Byean (2017) argues that most students and teachers in her school ethnography reported that they found TEE incompatible with their classroom practice given the test-oriented education system which values linguistic knowledge over communicative ability. As one of the teacher participants in her study claimed, CLT or TEE may “only works for affluent school districts in which students have already acquired basic linguistic knowledge” (p. 129). For English underachievers in her research, TEE further demotivated them to invest in English learning because English-only instruction did not help their comprehension or helped them to enhance test scores, which was valued in school English education. Yang (2018) also reports that it was through grammar-oriented English teaching, instead of TEE and communicative English teaching, that some students from working-class families who participated in her study were able to position themselves as good English learners and challenge the English Divide at the school. Conducting education according to the characteristics of a student is the basic principle of education. Tracking enables educational excellence and thereby promotes national competitiveness. (Kim Hong-Won 2006, Head of School Innovation Research Division, Korea Education Development Institute, Chosun Ilbo, Hyunjung’s translation, Emphasis added. Retrieved June 2, 2018 from http://news.chosun.com/site/data/html_dir/2006/01/01/2006010170241.html). The government claimed that tracking would maximize the diversity and the choices of education consumers as well as increase the pedagogical effectiveness of English classes, and thereby reduce sagyoyuk expenses by offering level-appropriate instruction for all students in schools. Opponents of tracking, such as the national teachers’ union, argued that tracking would stratify students and further aggravate the English Divide because (wealthy) parents would invest more in English sagyoyuk to move their children to upper-track classes. While supporters of the tracking policy often justify it as a way to adapt instruction to better meet students’ diverse needs, numerous researchers both in and outside of Korea show how tracking in fact exacerbates educational inequalities (e.g., Baek 2011; Gamoran 2010; Oakes 1985). In the Korean context, for example, Yoo (2013) argues that inexperienced teachers tend to be assigned to lower-track classes; educational opportunities and quality may differ among different tracks. After several decades of debates, tracking was officially reinstated in 2008. About 80% of Korean secondary schools adopted tracking as school policy as of 2009 (Hwang 2014). Yang’s (2018) ethnography on the English learning experiences of ESA returnees and English Underachievers in a Korean school illustrates how tracking, presumably intended to reduce the English achievement gap among students, instead strengthened students’ differential achievement in English. At the school where Yang conducted her research, the school exam focused on the production of grammar skills instead of communicative English competence. As such, while communicative English is perceived as the key in the national policy and curriculum, preparing for school English tests is the most important goal of English education at the local school level. The students in the General English course (where most ESA returnee students were taught) were engaged with decontextualized, production-oriented grammar activities. They were encouraged to participate in class activities through an IRE format (teacher initiation, student response, and teacher evaluation), which helped them to achieve high marks in school English exam. In the basic English course that targeted English Underachievers, however, “fun and easy” vocabulary games and comprehension-oriented activities were offered. These activities did not help to prepare low-track students for school exams. Furthermore, Yang (2018) observed that school language ideology which values “native-like” English and teachers’ emphasis on “correct” English marginalized Underachievers in school English-only spaces while privileging ESA returnees as legitimate English speakers. Subsequently, English Underachievers experienced further marginalization through tracking because the school curriculum did not prepare them for English test and their academic advancement or address their linguistic needs to improve communicative competence. Furthermore, Byean’s (2017) school ethnography on tracking at a Korean middle school explicates how students in the low-track of English class were constructed as unmotivated yeongpoja, with little or no desire to move up in their English learning, both by the teachers and the high-achieving students. Subsequently, students’ socialization into tracking led low-track students to position themselves as yeongpoja. In this sense, students’ unequal access to English learning is manifested in tracking through its effect on student’s identity construction as well as educational opportunities regarding curriculum and assessment (Byean 2017). At the same time, middle-class students in the higher track and their parents also felt pressure not to fall down to the lower track and thus having to invest even more in English sagyoyuk (Hwang 2014). In addition, the neoliberal marketization of education and subsequent increase in competition among schools and students have led teachers to exercise more control over classroom behaviors for test preparation in the high-track classroom as illustrated in Byean’s (2017) research. Therefore, despite the government’s claim to reduce the English Divide by offering more tailored instruction for students through tracking, the systemic inconsistency between curriculum and assessment in tracking practices contributed to reinforcing the English gap between the higher and lower track students (Yang 2018). This chapter has explored ways in which ELT increasingly becomes a site for reproducing social inequalities in neoliberal Korea. As illustrated in differential access to “good” English by ESA students and English Abandoners, ELT policies that have focused on enhancing communicative English in public schools have little impact on alleviating English Divide. A critical examination of the Korean case will shed light on understanding how we may envision a more inclusive English language education across the globe under the neoliberal economy. First, ELT research will need to pay attention to a more critical analysis of language ideologies (Irvine and Gal 2000; Woolard 1998; see also Darvin and Norton 2015) that guide ELT policy and practices under neoliberalism. As Shin (2016) explicates, the rise of the global language education industry and marketization of ELT not only reflects, but also reinforces, neoliberal social transformations. For example, as represented in the co-production of yeongpoja identity for low-track students in Byean’s (2017) study, ELT is mobilized in the formation of neoliberal subjectivities and functions as an essential part of the mechanism that perpetuates neoliberal ideologies. For this reason, critical ELT research, policy, and practice from a political economy perspective will need to adopt a view of language which highlights the social conditions of English language learning with a focus on social class as a central unit of analysis (Block 2014; Kanno and Vandrick 2014; Shin 2014, Shin and Park 2016). Furthermore, a critical analysis of how school-level policies and programs interact with the broader social selection processes will provide insights into the processes of the social reproduction as well as possible ELT policy and pedagogical intervention to interrupt the process. With ever more increasing social polarization and subsequent conflicts prevalent across the globe at this time, the key issue around public English education in many nations is how the government may view the role of public education to ensure that all students have equal access to the acquisition of legitimate English. The problem is that in today’s neoliberal world, the functioning of the government is also guided by the market principles of accountability which highlights efficiency and competitiveness rather than equity. In the Korean context, active neoliberalization of the economy and the society was paradoxically accelerated by the reform under democratic governments. Therefore, while public education in Korea continues to mask class-based inequality through the ideology of meritocracy, resistance is scarce because neoliberal market-friendly jargons, such as individual freedom and choice, are often conflated with signs of democracy and tend to be uncritically accepted as inevitable and beneficial to everyone (see e.g., Holborow 2015). The current government of Moon Jae-in (2018 – current) politically emphasizes inclusive education and proposed multiple policy initiatives to reduce the excessive amount of English sagyoyuk, such as banning early English-immersion in elementary schools (Lee 2018). The effects of such policies on actually reducing the English achievement gap among the students remain dubious, however, because the rich can still access to the kind of English which remains as powerful symbolic capital in the labor market outside of school system. What would be more helpful is to provide increased amount of state-funded quality English education in public schools where students from marginalized backgrounds can access legitimate English. For public education still remains the only space where poor students may have access to “good” English. Of course, the inherent contradiction here is that what counts as legitimate English in the job market is already imbued with relations of power. So even if a student from a marginalized background learns to speak English like a student from a more privileged background, his/her status as an illegitimate English learner will still somehow follow him/her without changing the linguistic hierarchy among different forms of English within the larger social structure. This is precisely what the Korean government failed to see in its attempts to address the English Divide: social reproduction through English happens because what matters in social reproduction is the symbolic power of English or English as capital of distinction, not just English language proficiency. Without such critical understanding, language policy ends up serving the interests of the dominant group (Tollefson 1991). ELT in Korea remains a contested terrain to resolve the tension between increasing class-based inequality resulting from neoliberal emphasis on competitiveness and excellence, and ensuring equal access to English learning for equity.